Opened on January 28, 2014, Vancouver’s Chef Tony Seafood Restaurant is located in the central hub of the City of Richmond: Empire Centre Mall, 4600 No. 3 Road. With exquisite designs and decorations, the restaurant is furnished with a splendid banquet hall for 16 tables, and 4 luxurious VIP rooms. Call 604-279-0083 now to reserve your table. 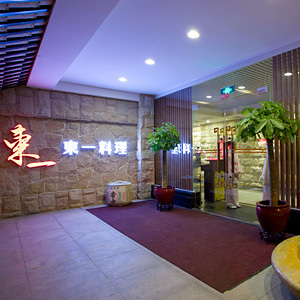 In early 2005, "Yi Dong Seafood Restaurant” was opened in Zhongshan City. In just three years after its opening, the restaurant has established its role as a leader in the field. 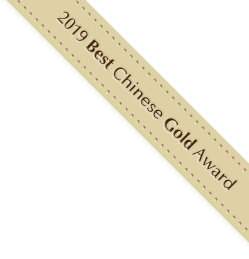 In June-July 2006, Yi Dong Seafood Restaurant was chosen by the national banquet chefs of Diaoyutai State Guesthouse in Beijing – the most prestigious state guesthouse of China - as a training centre for their chefs. 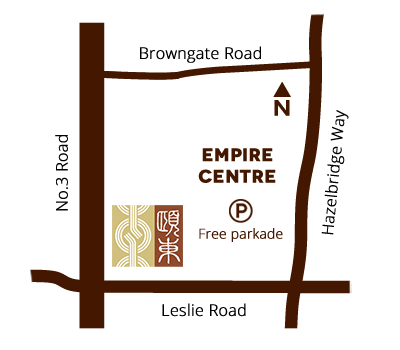 The subsequent opening of "Yi Dong" Xing Bao Seafood Restaurant in Zhongshan City has further strengthened the marque of “Yi Dong” and established the image of “Yi Dong” as a high-end Cantonese cuisine restaurant. 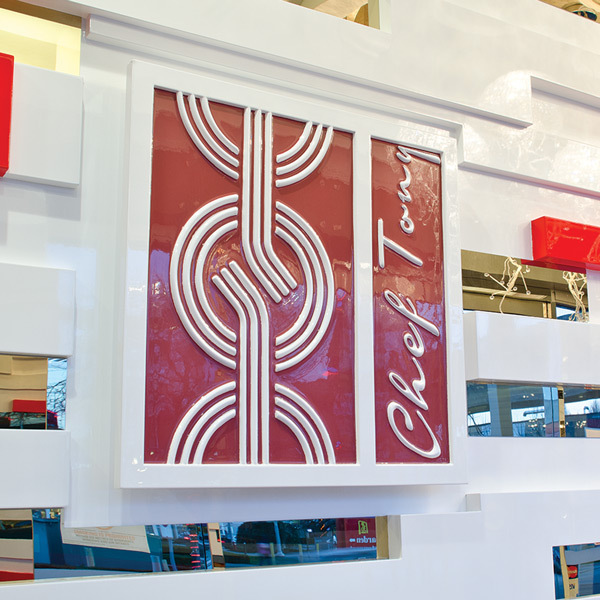 Chief Executive Officer, Tony He, is always passionate about cooking. At the age of 15, He started to work as an apprentice cook. In 1985, just five years after he joined the field, He was already one the most promising chefs. In the same year, He accepted a new challenge and started doing e-commerce. It was a huge success, but he could never forget his passion for cooking. He wanted to go back to do what he loved. In 1992, He and his friends set up their food and beverage company in Zhongshan City, and then subsequently opened their first Sea Harbour Seafood Restaurant there. In 1996, He made a critical life decision by emigrating from China to Canada with his family. Two years later, after thorough assessment and planning, He opened Sea Harbour Seafood Restaurant in the City of Richmond. It was a huge success too. To further his endeavours, He set up the "North America Sea Harbour F & B Management Limited", and expanded his business further south to the United States. 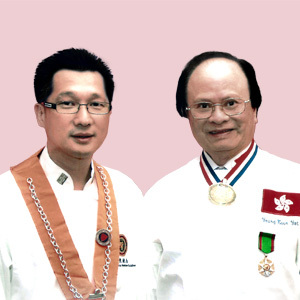 He became a student of the world famous chef, Yeung Koon Yat, and was subsequently recommended by Yeung to join Chaîne des Rôtisseurs (French Cuisine Association). He continued to exchange ideas and techniques with chefs around the world to further sharpen his skills and creativity in cooking. In 2002 and 2003, He opened two new Sea Harbour restaurants in Los Angeles: one in Rosemead and other in Rowland Heights. Five years later, the North America Sea Harbour F & B Management Limited and the three Sea Harbour restaurants in the USA and Canada have achieved tremendous successes. He decided that it was time to go back to his hometown - Zhongshan City - and invest in the food and beverage business there. 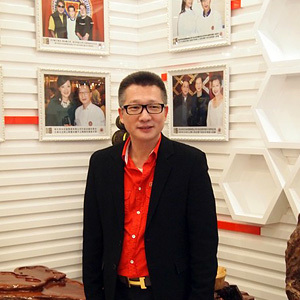 In early 2005, He opened his first Yi Dong Seafood Restaurant in Zhongshan City. With an area of over 3,500 square metres, the Restaurant adopts a new approach by embracing the concept of "combining beverage and food" from the western world. Apart from its specially designed red wine corner, its lighting and wine glasses are all carefully chosen to achieve a perfect atmosphere for customers to enjoy food and beverage. In the kitchen, only the most healthy and nutritious raw ingredients are used for the dishes. The chefs, with their best cooking utensil, are working towards the highest standard of food hygiene. Chef Tony always keeps a close eye in the raw ingredients provided by his suppliers, and insists that these raw ingredients must be clean, healthy, and sustainable in their supply. He has also invested over $100,000 to build a water purification system to make sure high-quality water is always available for his safe, delicious and healthy dishes. Tony He has decided to use Oriental Garden F & B Management Limited in Zhongshan as a base to develop his food and beverage enterprise. 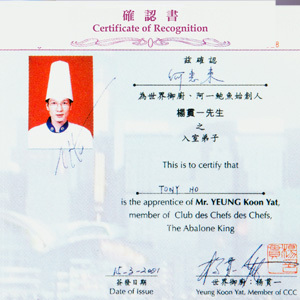 He is using Yi Dong Seafood Restaurant as a training centre for cooking professionals and a hub for creating new dishes. With an aim to brand Yi Dong as the best food and beverage in China, to “develop a healthy eating culture” and to further promote the culture of Chinese food and beverage, He endeavours to serve only the best food and services to his customers, in additional to a comfortable and elegant dining environment, proper management, and on-going creativity and development. The Company focuses mainly in food and catering services as well as food processing and sales business. 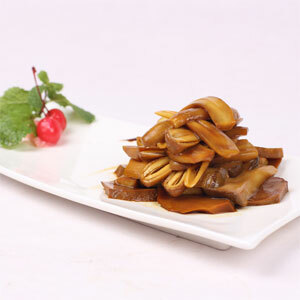 It serves high-end Cantonese cuisine with its prestigious marques of "Sea Harbour", "Yi Dong" and "Dong Yi". Oriental Garden F & B Management Limited has many years of experience in managing food and beverage services. Through its highly professional management team and well-established scientific management system, the Company operates and manages its own food and beverage enterprises, and endeavours to become a "management expert in food and beverage services”. It also provides comprehensive business, management and consultation services to Chinese food and beverage companies in China, Hong Kong, Macao, the United States and Canada. Located in the central hub of the City of Richmond: Empire Centre Mall, 4600 No. 3 Road, and furnished with a bright, trendy banquet hall for 16 tables and 4 splendid VIP rooms. The first Yi Dong Seafood Restaurant of the Group. 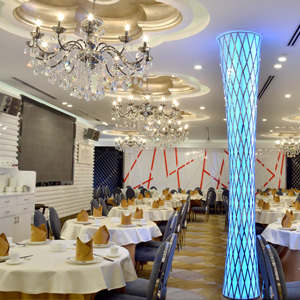 Located at Shiqi of Zhongshan City with an area of ​​3,300 square metres, the restaurant serves new-style Cantonese dishes in its main banquet hall, special VIP tea house, and 20 luxurious VIP rooms. Located at Shaxi in Zhongshan with an area of ​​over 4,000 square metres, the restaurant has a banquet hall for 46 tables, multi-purpose hall, VIP lounge, traditional Chinese-style VIP rooms, and 21 VIP rooms with different styles and designs. 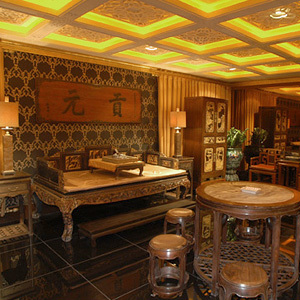 Located in Shaoguan City with an area of over 4,000 square metres, the restaurant is furnished with a banquet hall for 38 tables, special VIP tea house, Chinese-style VIP rooms, French-style VIP rooms, and 18 VIP rooms with different styles and designs. Located in Zhongshan City with an area of ​​over 1,000 square metres, this restaurant has 4 teppanyaki rooms and 8 VIP rooms, and serves only the most authentic Japanese cuisine. Located in the central district of Rosemead City in Los Angeles, this restaurant occupies over 600 square metres furnished with two VIP rooms and a banquet hall for 18 tables.